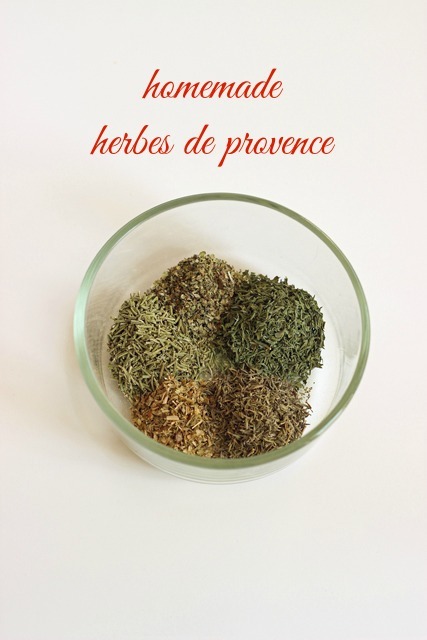 Save money and season your dishes well with this homemade Herbes de Provence recipe. While we were in France last month, I did a fair amount of meal prep. Certainly not as much as I do at home, but I did cook and prepare meals during our vacation in order to save money and also to make sure we were eating healthier food. (Don’t be fooled; France still has KFC, Subway, and McDo. There’s cheap junk to be had anywhere, even if it’s not so cheap as here.) But you can lose weight in France. I didn’t have the space or the inclination to stock a full spice cupboard so I carried a very limited array of items: sea salt, olive oil, red wine vinegar, and herbes de provence. 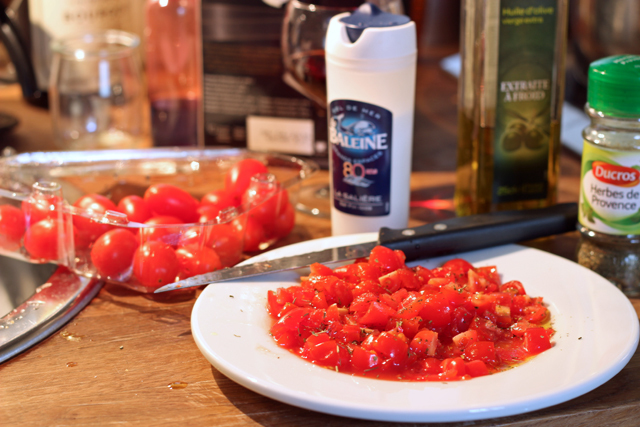 Prior to our trip, I was extremely partial to “Italian herbs,” a blend of just that – Italian herbs. I looked for it at the Monoprix off rue Daguerre, but they didn’t have it. 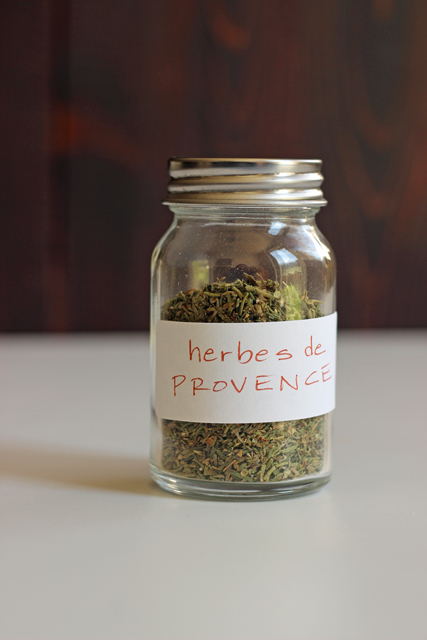 I had to settle for Herbes de Provence as a multipurpose herb. Typically, I don’t love the “herbes de provence” I’ve bought in the states because they usually have lavender in them. I don’t like culinary lavender, but I’ve tolerated in recipes for years. 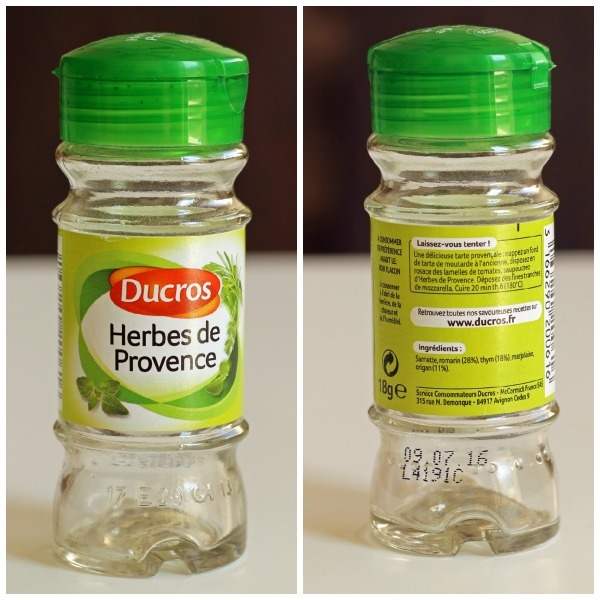 I read the ingredients on this Herbes de Provence from Ducros and saw that it did not have lavender. Yay! I ended up using it liberally throughout our month in France, sprinkling it in vinaigrette, on tomatoes, in pasta salad, in bolognese. In short, I’ve fallen head over heels in love with this herb blend. I carted the half empty bottle home and used the last bits up. But, saving the bottle wasn’t just a frugal money-saving tactic. The recipe is on the back of the bottle! I have no idea if that’s a requirement of labeling in France, but they mentioned the percentages of some of the herbs on the back. Plus, they named all the herbs, something not all American spice companies do. Since I can do math as good as a sixth grader, I was able to approximate this formula for herbes de provence and now make my own blend. 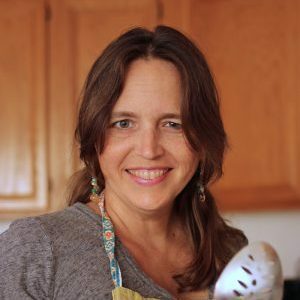 Making my own blend from herbs that I buy in bulk from Costco or the health food bulk bins is a more economical way to keep myself stocked in my favorite herb mix. If you buy dried herbs in bulk or even grow your own, this is a great little blend to keep on hand. It’s so multipurpose and amazingly delicious. Be prepared for an onslaught of recipes featuring this little star. It’s my new best friend. I had small jars of most of the herbs, but I only had rosemary sprigs. So, I pulled those off the stems and chopped them up a bit. I’m not a fan of big rosemary leaves getting stuck in my teeth. Consider making a big batch of this to give as gifts with a few recipes attached. I might just have a free printable for you in a week or two. Ahem. And I most definitely recommend keeping a small bottle of this stuff handy for your own home cooking. Just a whiff of it sends me back to the Mediterranean. Oh la la! In a small mixing bowl, combine the herbs. Store in an airtight container at room temperature. 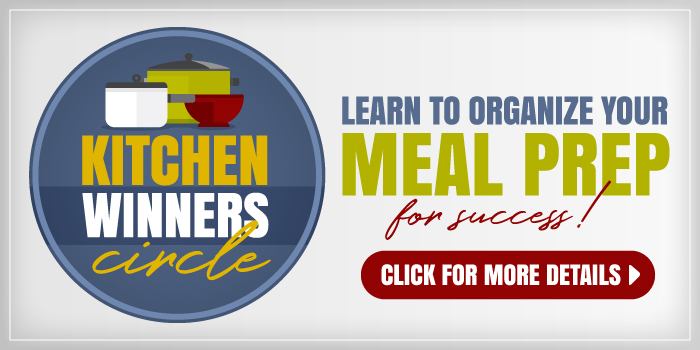 Store the herb blend in the freezer for longer storage. Looks like a great spice blend…. Watkins stopped making their Herbes de Provence that had no lavender in it. I went on to make my own using their blend which is like yours but with one change. Instead of Oregano they used Basil. I been using this basic blend except for adding oregano when I desire it. I also use this in tons of things. Veggies, eggs, poultry, you name it. Pretty much anything calling for Italian Herbs gets HdP used instead. I’ve had both with and without lavender and don’t really notice much of a difference, but it is generally less expensive without it. Last time I visited over there, I bought some, and then when my mom came back here to visit, she brought me a big bag of it, so I would have plenty. Nice to have a recipe just in case I need it, although I have no idea what summer savory is. Have to look that up. Something else you might like to try is blending in some of the HdP with some big chunky sea salt. It works better with a slightly more damp sea salt like they have, rather than the drier stuff we tend to have (at least here in Florida) but that makes a lovely little pop of flavor to sprinkle just a touch of that on some steamed veggies or some scrambled eggs. I bought a jar of that in one of the villages and loved it so much I had to go find some of that salt to make my own batch. I didn’t know that you mom lived there. How often do you go? I’m surprised to find no lavender. If I wanted to add some, how much do you think would be right? Thanks! Yay! I have only seen it with lavender included as well and I am not a lavender fan. I will definitely be trying this. We will be all set when you send me the recipe for Summer Savory. I have looked everywhere. Don´t have access to a Costco, and Watertown WI. is not the gourmet hot spot of the Great Lakes. I have to tell you how lucky you were to travel to Europe and taste the foods locally. Hope you get to go again.I am pea green with jealousy. (kidding) If you have a recipe I will be thrilled. Then I can finally use a couple of recipes that called for Herbs de Provence. 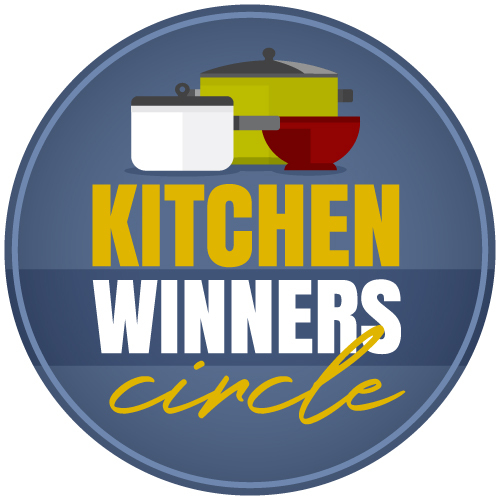 Best wishes and thanks for the recipe.Will be watching and hoping for the second one. Thanks again, BarbK. There is no recipe for summer savory. It is an herb. I have bought it at my grocery store. I am so excited to make this blend! I bought summer savory on line. Yes, that’s fine. Slightly different flavor, but still good. Can you tell me what the summer savory is?? I have never heard of that one.